Apple and Chipotle Mexican Grill look like undervalued opportunities for investors with a long-term horizon. Being an investor in your 40s provides some important advantages. You still have a lot of time until retirement, and this means you can focus on maximizing returns by investing in companies with big upside potential in the long term, even if these names tend to be quite volatile on a short-term basis. In that spirit, companies such as Apple (NASDAQ:AAPL) and Chipotle Mexican Grill (NYSE:CMG) look like smart choices for investors looking to transform short-term uncertainty into long-term opportunity. Apple stock is down by almost 30% from its highs of the last year, mostly because of increasing concerns about declining sales in the coming quarter. The smartphone industry is maturing, and the iPhone 6 was a booming success for Apple in 2015, making year-over-year comparisons remarkably tough in 2016. In this context, management announced that it's expecting revenue during the March 2016 quarter to be in the range of $50 billion to $53 billion, and this implies an year-over-year decline of 14% to 9% versus the same quarter last year. On the other hand, there are several reasons to believe that investors could be exaggerating their negativity when it comes to Apple. Management said in the latest conference call that the company reached a major milestone last quarter, surpassing the 1 billion active devices in its installed base for the first time ever. This bodes well for the company in terms of iPhone renewals and growth opportunities in areas such as services. According to a recent research report from ChangeWave, satisfaction rates among iPhone customers are off the charts, with a 99% satisfaction rate for iPhone 6s and iPhone 6s Plus users. Nearly 60% or all iPhone customers around the world haven't yet upgraded to the iPhone 6 or iPhone 6S versions, so it makes sense to expect improving demand in the iPhone segment because of accelerating upgrades in the middle term. In addition, sales in the services segment grew 25% last quarter, amounting to 8% of total revenue. This division won't move the needle by much in the short term, but it will most likely generate an increasing share of total sales over the coming years, and this should have a positive impact on overall revenue growth. Importantly, Apple stock is priced for lackluster expectations. The company carries a price-to-earnings ratio of 10 times earnings over the past 12 months, a huge discount versus the average company in the S&P 500 index and its price-to-earnings ratio in the area of 18. If growth turns out to be higher than expected in the middle term, then Apple stock offers enormous room for appreciation from currently depressed price levels. Chipotle Mexican Grill is down 35% from its yearly highs, as the fast-casual restaurant chain is being hurt by an E. coli outbreak that kept customers away from the stores over the past few months. The official investigation about the outbreak is already over, but it's hard to tell what kind of impact it could have on Chipotle over the coming months. Comparable-store sales declined 16% in November, 30% in December, and an even larger 36% in January. Chipotle has also implemented a series of safety procedures aimed at ensuring that it won't face similar problems in the future. Among them, Chipotle is doing high-resolution DNA-based testings of key ingredients, changing its food preparation and handling policies, improving internal training in food safety, and paying sick leave, so that employees have no incentive to work while ill. Sales are under heavy pressure and costs are increasing because of all the measures the company is taking to improve its food safety standards, so earnings will probably be quite disappointing in the coming months. Nevertheless, Chipotle Mexican Grill is still one of the leading growth players in the fast-casual restaurant industry, and it has the strength to completely recover from its recent setbacks. Chipotle was making only $1.8 million in revenue back in 2010. Fast-forward five years, and the company produced $4.5 million in sales during 2015. Customers love Chipotle, and management is doing the right thing by focusing on restoring customer confidence for the long term, even if this hurts earnings over the coming months. Chipotle is planning to open 220 to 235 new restaurants in 2016, an 11% to 12% increase from 2010 restaurants at the end of 2015. The company is taking its first steps in international markets, and it's also expanding into Asian cuisine and pizza with its ShopHouse and Pizzeria Locale concepts, so Chipotle still offers enormous room for expansion. Chipotle trades at a valuation premium versus the broad market, but this is quite reasonable coming from such a strong growth business. 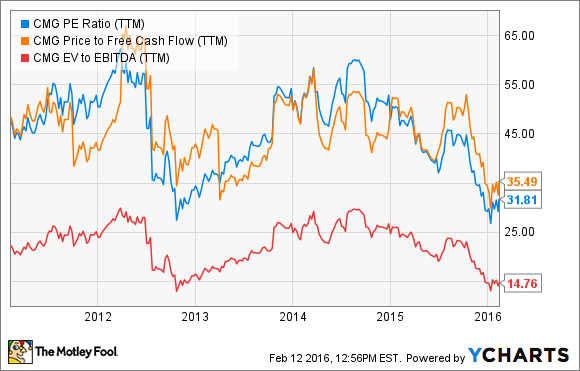 Even better, when looking at ratios such as price to earnings, price to free cash flow, and enterprise value to EBITDA, Chipotle stock is trading near the low end of its valuation range over the past five years.